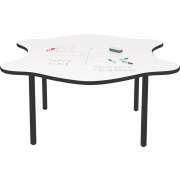 Encourage cooperative play and teamwork with a classroom table from Hertz Furniture. 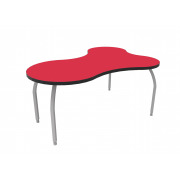 What is the ideal table shape for your learning space? School tables come in all shapes, sizes, colors and heights, so you can find the perfect fit for your classroom layout. 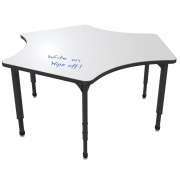 Well-designed study tables help improve class productivity and student comfort. 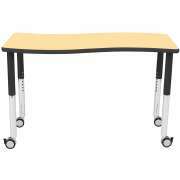 Hertz Furniture carries high-quality school tables, activity tables and computer tables. You can choose from our huge selection of styles. 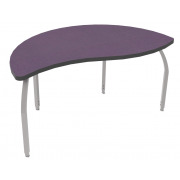 Not sure which school table will work best for your classroom environment? Give us a call - we&apos;re here for you every step of the way. 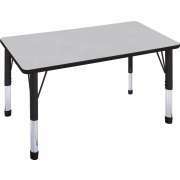 How can I find the right table for my classroom? 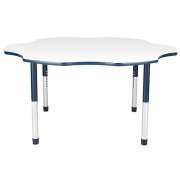 Activity tables are available in a wide variety of shapes and sizes, all of which have their own advantages. 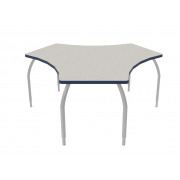 The classic rectangular and square-shaped tables will give your study space the clean look of straight lines. Round school tables make it easy for small groups to work together because all students can easily see and speak to each other. 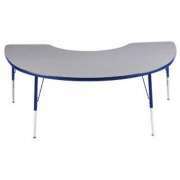 Horseshoe and kidney-shaped classroom tables are great for a teacher who is working with a small group of students. These shapes enable the educator to sit on the inside edge while the students sit around the outside. This way the teacher can easily work with individual students or the whole group from a seated position. If you are looking for a more original out-of-the-box shape, we also have flower, clover and a-plus school tables. Who are the best school furniture manufacturers? This huge selection is not only limited to shapes. 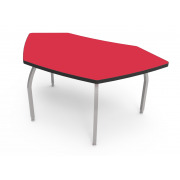 Our student tables come from some of the leading manufacturers including Mahar, Academia, Russwood, ECR4Kids and Allied Plastics. We also have many sizes to choose from, so you can select the optimal shape and tabletop area for your students and learning space. It is worthwhile to consider whether it is preferable to seat many students at each activity table or facilitate smaller groups by buying more school tables with less seats. You may also choose to order a variety of shapes and sizes so students can choose what they prefer. What school table height will fit my students? In order to help your students sit comfortably and learn better, it is important to make sure that your activity tables are appropriately sized. 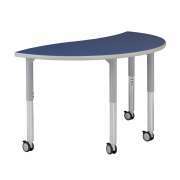 The optimal choice for any setting that includes children of different ages and sizes is an adjustable-height activity table. 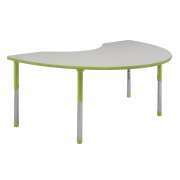 If you are looking to furnish a preschool or daycare, we offer preschool tables and toddler tables as well. And of course, there is always the option of standard-sized tables. 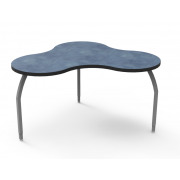 There are many distinct features that can make your table even more convenient. 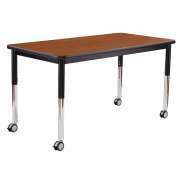 If you are looking for portable options, you can choose either folding tables or tables with wheels. Many activity tables come with the option of colored accents. Some have colored surfaces, while others feature colored edge banding, legs or glides. Each of these options offers a great way to brighten up your classroom. How can I ensure that my classroom tables will last? 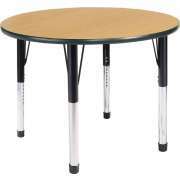 Classroom tables come in a variety of materials. 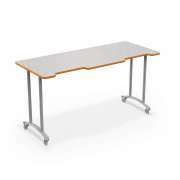 There is the most common combination of steel legs and high pressure laminate surfaces, as well as durable solid wood tables and even aluminum study tables. For extra strength, you can also get hercules legs or hairpin braces which provide better support to the tabletop for improved durability. 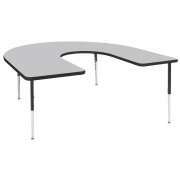 What kinds of tables do I need in the classroom? 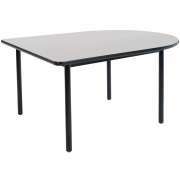 We don&apos;t just carry the basic classroom tables, we have any kind of table you might want in your learning space. Need sensory tables to help young learners in your preschool or daycare develop fine motor skills? Hertz Furniture has sand and water tables in a great selection of sizes, colors, styles and materials that your little ones are sure to love. Want to set up a few computer stations inside your classroom? No problem! 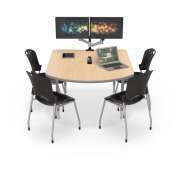 We offer a variety of computer table styles in a choice of heights, sizes and price-ranges. With technology in the classroom becoming increasingly dominant, computer desks are a must-have. 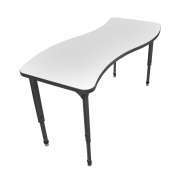 Does class size affect the kinds of classroom tables I should get? Class size is one of the many factors that should influence your choice of school tables. While not every school has the privilege of purchasing new tables as class sizes change, if you have the option the right tables can make all the difference. Room arrangements should be based on how many students are in the class and how many can fit at each table. Ideally, all of the tables should be full but not too crowded, with a good mix of students in each cluster. Whether you are remodeling, updating your classroom, or just looking for a few new pieces, Hertz Furniture is here to help you with every step of the process. Our design team experts are happy to assist you in choosing the best classroom tables for your space, and setting them up in the optimal layout for learning. Don&apos;t hesitate to give us a call and find out how you can start improving your classroom today. From choosing the right school table shape to assembly and beyond, Hertz Furniture is here to help you from start to finish.